Hey, it has been a while since I posted here, so it’s about time to give you an update! So whats next? I probably won’t make music in Laserdance style anymore, because when they start making music themselves again there’s really no point in trying to keep their music ‘alive’ is there? Also I’ve already done that, more or less, and am looking for new challenges. So I am working on some new music, and searching for new sounds and mixes of styles. After all, Laserdance is not the only music-style I like. I also like early Synthpop like The Cure, Depeche Mode, Erasure, Yazoo, Eurythmics, Ultravox and so on. And also music from Koto, Divine, Bobby O., Georgio Moroder, Art of Noise as long as it has driving basslines and pumping beats! I grew up in the eighties and nineties so no wonder I like these styles of music, and of course my music will be inspired by those artists. Also for another project I am working on mixed styles in Trance/Techno and Space synth and Italodance styles. When this will be released it will be most probably under a different name. So I will not entirely give up on Spacesynth, I am just looking for new ways to integrate other styles into this music. I’ll keep you posted! 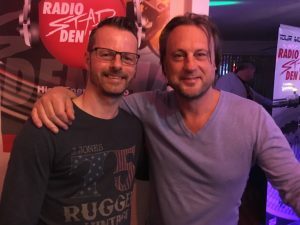 Tonight the original Laserdance producers Erik van Vliet and Michiel van der Kuy were in the studio at Radio Stad Den Haag. They were playing my remix / cover as they were getting ready for the interview.